Richmond learned last night what our employees have known for a while: Workshop Digital is an awesome place to work! We were thrilled to be recognized by the Greater Richmond Chamber as the best small business in Richmond for young professionals. Our team was out in force for the Chamber’s Impact Awards dinner, where we took home that workplace award from Helping Young Professionals Engage (HYPE), the Chamber group that focuses on young workers. We clean up nice, don’t we? Dixon Hughes Goodman, an accounting firm, won in the large business category. We beat out two amazing companies in our small-business category. CarLotz, a fast-growing car consignment business, is a long-time client of ours. INM United, a local web development shop that builds mobile and web software products, is also a partner of ours. We highly recommend that you check out their work. Both of these companies are part of Richmond’s awesome entrepreneurial community, and we are thrilled to share the stage with them. We were also a finalist for the small-business category of the Chamber’s Impact award, which recognizes companies making a difference in the local economy, community and the lives of employees. The prize went to Hardywood Park Craft Brewery, an awesome business that has brightened the lives of Richmonders since opening in September 2011. Again, being nominated next to them is awesome. This is our second major award in as many weeks. Last Wednesday we turned out to celebrate our recognition by the Richmond Venture Forum as a “company to watch” in the growth category. And in early October we took took the top spot on the RVA 25, a list of the fastest-growing companies in Richmond. Is co-founder Brian Forrester happy, confused, or both? 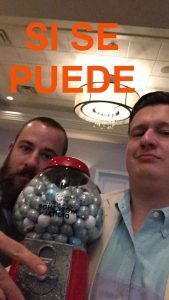 SEO analyst Derek Gleason (left) and SEO manager Jack Boland pose with the Gum ball Machine of Glory (aka the trophy). We want you to be awesome at your job and life, so we provide: Unlimited PTO, an eight-week training program for your learning needs, foosball tournaments, company outings, industry events, movie theater style popcorn machine, volunteering opportunities, quarterly meetings to discuss your career path, health insurance (we pay 75 percent of the cost), a 3 percent 401k employer contribution and life/disability insurance. A ping pong table is also in the works for the office, which is located in the heart of Richmond’s Shockoe Slip. We’d love to hear from you.